Recently we heard the comments from Fed Chairwoman Yellen which appeared to be dovish. Crashing oil prices and a rising US dollar will put a halt to any interest rate increases from the Fed. Weak Holiday sales and increasing unemployment in 2015 are a possibility especially as I expect layoffs in the once booming fracking sector. Equities are rallying and following tax loss selling season the TSX Venture which is hitting decade lows may experience a major bounce due to the January Effect. The January Effect often benefits small cap beaten down situations as large investors reposition for 2014. In the middle of 2011, the US cut back on QE while Japan and Europe accelerated currency debasement. This led to a flight of capital to the US dollar and equities and out of commodities especially copper, oil and precious metals. So from 2011 until today we have seen a decoupling of a rising US dollar and equity market with a declining natural resource market. This has not been seen since the late nineties. Could QE4 Be a Possibility in 2015? Similar to the late nineties, negative sentiment for the miners is at an all time high as investors are panic selling shares in order to chase the high flying equity markets. The global economy is not as strong as investors believe and this rising dollar and collapsing oil price could drive the US back into recession. QE 4 may be the next option or negative interest rates right here in the US. It was interesting to see the reaction after the Fed Meeting going into tax loss selling season. Investors are beginning to once again realize that zero or negative interest rate policies are here to stay in the West. Notice the Swiss instituted a negative rate policy to deter capital flight from Russia. Meanwhile, the Russian Ruble is in freefall as the Central Banks raise interest rates to over 20%. Russians are buying gold as they realize that the US dollar rally could fizzle out soon should the Fed propose QE4. This down period in the resource sector in prior years was followed by a very powerful first quarter. Late December buying has provided some excellent trading opportunities in the resource sector in the past. As we close out the year and tax loss selling season, we must not ignore the historic situation we are in right now with recent black swan events with Russia which has driven the US dollar and large US equities to nosebleed valuations and crashing the commodities market to historic lows. It is my opinion that investors sitting on US dollars are approaching a huge buying opportunity during this tax loss selling season when junior resource stocks are beaten down to a historic pulp. Smart investors should be placing stink bids now before they leave for the holidays. Buys in late December and sells around March have proven to be good trading strategies for the resource sector in prior years. 1)I believe recent turmoil in the financial markets are economic efforts to keep Russia in check following the annexation of Crimea. This recent foreign exchange volatility has caused a collapse in the Russian Ruble and Euro and a massive run in the US dollar. Remember wars can be fought without bullets utilizing foreign exchange and financial market manipulations. 2)Concurrently, the Saudi’s boosted oil output cutting the price to below $60 a barrel. This could’ve been payback for Russia’s support of Assad’s regime in Syria. 3)US Central Bankers have been cutting back on QE allowing the dollar to rise. A rising dollar and low oil prices is devastating to many emerging resource rich nations such as Russia, Nigeria, Venezuela and even the US and Canadian Oilshale boom. 4)Banks sit on a lot of energy loans and defaults could increase. A potential bond default affecting a major bank is possible leading to further volatility. Remember that historians show that financial volatility and hyperinflation like what we are seeing in the resource rich emerging nations could usher in extreme radical political parties, regime changes and geopolitical instability. Gold is hitting record highs in Russia, yet is hitting new lows in dollar terms. Some compare 1933 Germany to today’s Russia. Only time will tell. Incredibly, gold has held in versus a rapidly declining oil price and the gold to oil ratio is hitting new three year highs. This could be a boom to large tonnage and open pit gold producers where a large portion of their cash costs are based on the oil price. 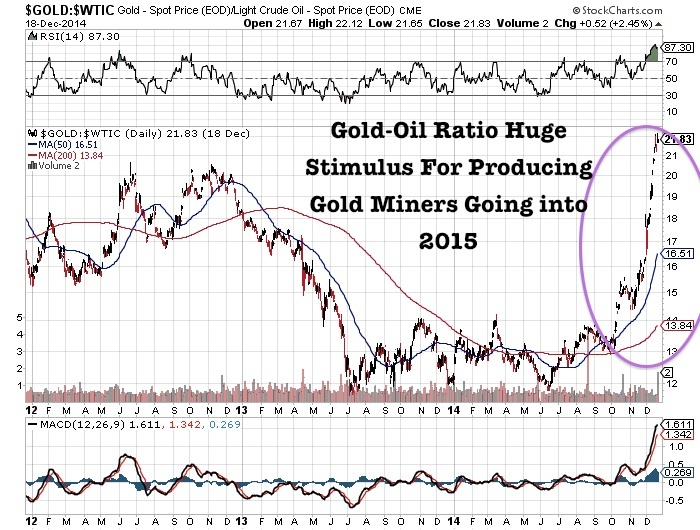 I expect some of the major miners to outperform in the new year factoring the cheaper energy prices. This could benefit the high quality junior miners with economic assets that could fuel low cost production. 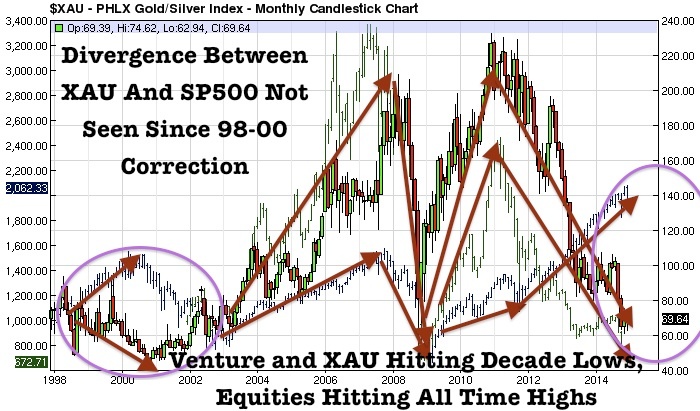 Safe haven demand should increase for gold and junior miners in 2015 as the US dollar rally fizzles out due to a Fed reluctant to raise rates. We expect some of the gold resource funds to see inflows of capital in the new year as negative or zero interest rates are prevalent in the West. Even though the Venture has free fallen on what I call the Putin Put on Commodities. I expect savvy investors to come in and finance high quality junior mining opportunities where we could see outsized gains. I follow price volume action during seasonally weak periods to identify savvy accumulation by institutions.